We have a range of packages to make your day perfect with the addition of a visit from our feathery friends. Bring a real touch of magic to your ceremony with one of our trained owls delivering your rings. At the right moment, a member of your wedding party will place on a glove and call one of our beautiful owls down the aisle carrying your rings, to the delight of your guests. Whether it’s the beautiful Barn Owl, or the magnificent Bengal Eagle Owl, our birds are sure to add the wow factor at your ceremony. 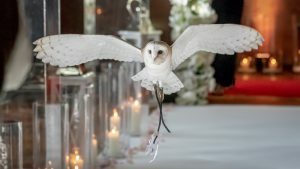 For the best result, this service is usually a complete surprise, the wedding guests are unaware that the owl is going to make the delivery. 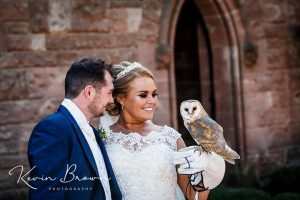 On your wedding day we will arrive at the venue early to allow the owl to become accustomed to the venue and also so that we can meet and chat with the person that is receiving the rings. The owls have flown to thousands of people so they know what is needed from them. During the ceremony the owl will wait patiently out of sight until the rings are needed. At that point they will fly silently towards the glove of the receiver of the rings. Once the rings are delivered, the owl will fly back to its handler allowing the ceremony to continue. 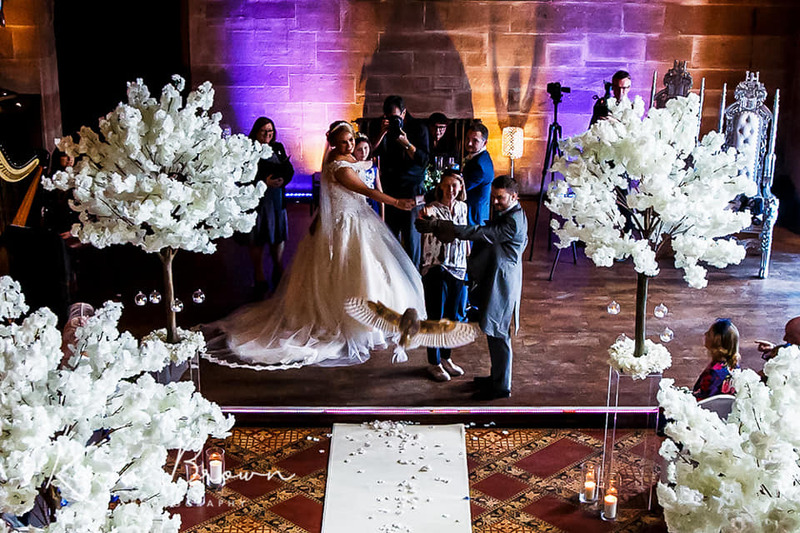 Why not have a selection of birds to meet your guests after the ceremony? Our professional falconers will circulate among your guests with a bird allowing them to handle and have their photographs taken. This allows you time to have your all important first photographs whilst your guests are entertained. We have fun doing themed weddings too! Want to ask that all important question but not sure how? Why not let our birds help you. There are a number of ways that this can be done so please give us a call on 07719 909967 to discuss your requirements. I contacted Shropshire Falconry with regards to assisting me proposing to my girlfriend. 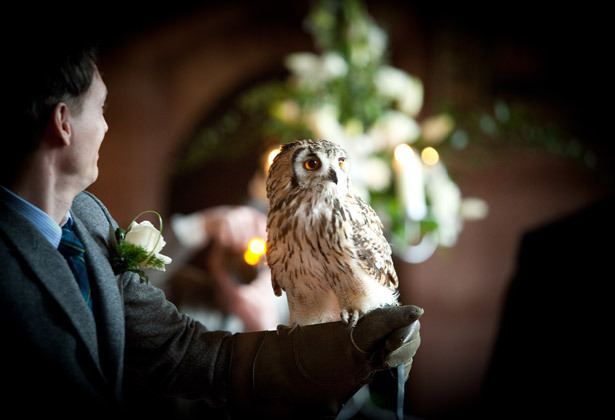 I specified the venue (Peckforton Castle) and explained I would like to use an Owl to do so. Lisa was extremely helpful and couldn’t have catered for me enough from start to finish. She is very knowledgeable and enthusiastic about the birds and we planned the occasion of how it would happen. When the day arrived, everything ran on time and the stunning Owl arrived promptly, to deliver the ring. The Owl was extremely friendly and clearly well looked after. Thanks to everyone at Shropshire Falconry for making an experience happen that will never be forgotten. We can provide bespoke experiences for something different for your party. At our Centre we have indoor as well as outdoor flying areas along with a comfortable training room and kitchen.